A separate poll from Morning Consult released Tuesday named Amazon the company "Americans love the most," with a net favorability rating of 79 percent. Despite criticism from politicians and protests from some vocal locals, most New Yorkers are in favor of a deal to bring Amazon's new headquarters to the city, according to a new poll. The Quinnipiac University poll found 57 percent of registered New York City voters approve of the controversial deal while 26 percent disapprove. The deal is even more popular in the borough of Queens, where the internet retail giant's HQ2 will be located. Sixty percent of voters there are in favor of the deal, while 26 percent are opposed, the poll found. The poll also determined that voters are well acquainted with the company — more than 70 percent of those surveyed use it. The poll underlies Amazon's enduring consumer popularity, which has not shown any major signs of decline despite growing critiques from politicians and academics concerned over its growing market power — and even a few tweets from President Donald Trump. A separate poll from survey company Morning Consult released Tuesday named Amazon the company "Americans love the most," with a net favorability rating of 79 percent. It also tied with Google for the title of "most admired employer," with 60 percent of respondents saying they'd be proud to work for either company. The Quinnipiac poll also shows New Yorkers giving the benefit of the doubt to Amazon. Despite opponents' worries that the Amazon deal will lead to a housing shortage and more crowded subways, 54 percent of voters say they don't have any concerns about the company's move to Long Island City, Queens. But New Yorkers did have concerns with some of the details of the deal — in particular the agreement's architects, Gov. Andrew Cuomo and Mayor Bill de Blasio. The deal, which is expected to lead to more than 40,000 jobs and $27 billion in tax revenue over the next 25 years, includes $3 billion in tax breaks and incentives, and gives most of the control of the project to the state. "While New Yorkers give the thumbs up to Amazon moving one of its new headquarters to Long Island City, they are divided over the sizeable carrot offered" to the company, said Quinnipiac poll analyst Mary Snow. The poll showed 46 percent of voters in favor of the incentives, with 44 percent opposed. A vast majority of respondents — 79 percent — say the city should have more input in the project. Despite their success in luring one of Amazon's two HQ2s to Queens — the other is going to Crystal City, Virginia — New Yorkers aren't happy with how Cuomo and de Blasio handled the deal, the poll found. Only 34 percent and 31 percent of voters approve of how they handled the deal, respectively. De Blasio press secretary Eric Phillips still took the poll as a win, tweeting, "Poll: New Yorkers like good-paying jobs for people of all backgrounds." Opponents of the deal were unmoved. "This Quinnipiac poll means nothing," Stuart Appelbaum, president of the Retail, Wholesale and Department Store Union, said. "The reality is that opposition to this terrible Amazon HQ2 deal for New York City continues to grow by leaps and bounds." Jonathan Westin, executive director of New York Communities for Change, offered an even strong rebuke. "This poll is trash and should be thrown away with the rest of today's garbage," Westin said. 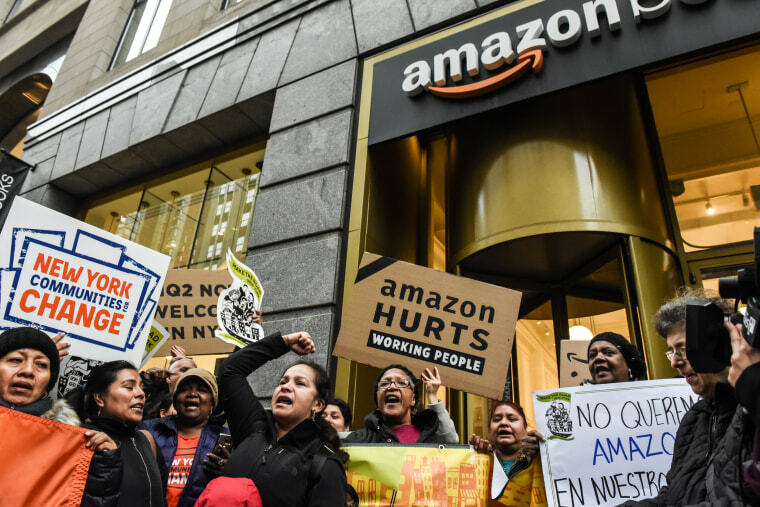 "We know that the level of anger toward Amazon and the HQ2 deal is intensifying and spreading."